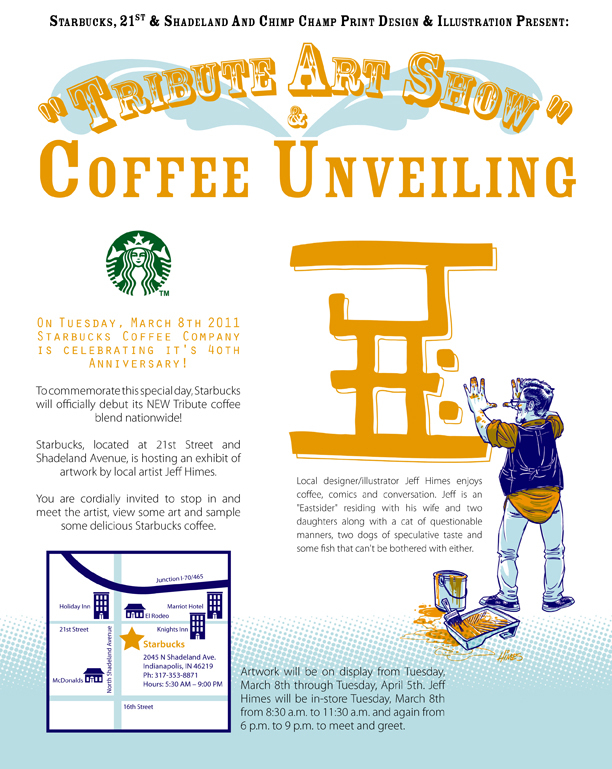 Tuesday, March 8th is the 40th anniversary of Starbucks. To commemorate the occasion, they will be unveiling a new coffee blend nationally. The Starbucks at 21st and Shadeland Avenue, in Indianapolis, has asked me put up some artwork and be on hand for the day as part of the festivities (check out the handy flyer!). So, if you are (or are going to be) in the Indianapolis area this Tuesday you should stop in and check it out! I will be in-store from 8:30 a.m. to 11:30 a.m. and back again from 6 p.m. to 9 p.m. that evening to meet people and talk some art… and drink a LOT of coffee. Hope to see you all there! Don’t forget you can tell people about your art show on IWG.